You don’t have to make huge renovations or spend a fortune to improve the look and functionality of your kitchen. 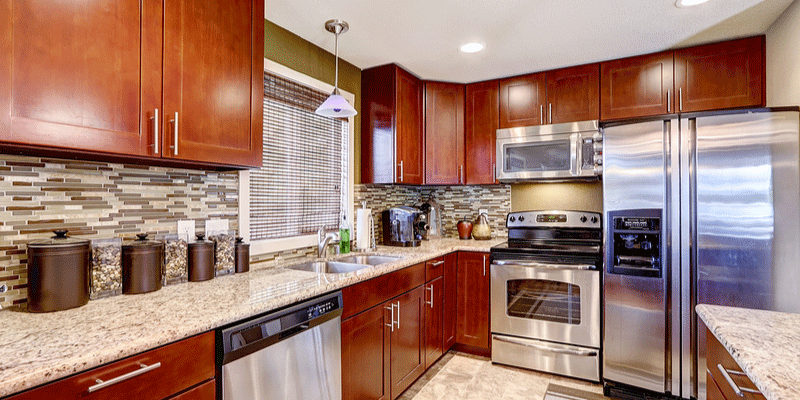 The backsplash in your kitchen makes a big statement in regards to overall style and design. A backsplash requires fewer materials than countertops, which allows you to splurge a little and go with a more fancy or eye-catching material. Sometimes this is the best place to go bold because it’s not overkill and can create a nice contrasting look. Some popular backsplashes include fun mosaics, metallic tiles or steel tile. Specialized pullout drawers can make your life so much easier and more organized. Pullout drawers and cabinet organizers make a huge difference in regards to the overall functionality of your kitchen, and the best part is they don’t have to cost much. In fact, many of these additions can be added DIY style. Adding diffused, mid-level ambient lighting adds style, form and function to your kitchen. It’s generally pretty affordable to add lighting underneath your upper cabinets. This creates a beautiful glow that accentuates pretty focal points, and makes it easier to find things when it’s dark. It also helps with reading recipes and increases safety when fine chopping ingredients. Under cabinet lighting isn’t the only place you can score a lot of wow for very little pocket change. In fact, any kind of lighting can make a big impact on your kitchen without breaking the bank. For instance, hang pendulant lighting fixtures above the island to better draw the eye around the room and infuse your space with new style. Bonus perk: Your kitchen just got lighter and brighter. The more natural light your kitchen gets, the bigger, better and brighter it feels to you and all who enter. If adding windows is out of the budget, you might want to consider adding a skylight or even a faux window. For the most part, cabinets tend to be pretty age-neutral, especially when kept up to date with a fresh coat of paint every now and again. The one thing that tends to reveal the age of your cabinets is the door handles. Over time, cabinet handles get dirty and outdated, making your cabinets appear in need of a premature facelift. Cabinet door handles are far more important than they are often given credit for. New hardware can give your kitchen a boost in the style department, and cabinet hardware is one of the most affordable things you can upgrade in your kitchen. Crown molding makes a huge difference to the appearance of a room. If you buy molding wholesale and then hire a contractor to install it, you can score this look for very little investment. Crown molding can be added to cabinets, walls or floorboards for little money and a lot of wow factor. A new oven or refrigerator can alter your kitchen drastically in terms of looks and functionality. The latest ovens not only bake but they steam as well. The latest refrigerators can synch with your smartphone, letting you see if you’re out of butter before you buy 10 more sticks at the store. Heating drawers are yet another awesome appliance that can change the ways in which you use your kitchen. You can also add style and functionally with smaller appliances that don’t cost $1,000+. Purchase a matching assortment of Kitchen Aid blenders, mixers and food processors in a fun shade of blue and you instantly upgrade the look and function of your kitchen. Changing out your sink faucet can make a bigger impact than you might think. There are many beautiful options available on the market that provide sleek style and added functionality. For instance, there are faucets that’ll turn on when you tap them, and faucets that come with large extendable handles. Old yellowed ceilings or popcorn ceilings need an upgrade, ASAP. A simple coat of paint can do the trick, or you could step up your kitchen appeal with design tiles or other accent tiles or beams that make your ceiling truly stand out. Some ceiling tiles currently on the market are incredibly easy to install, as they come with trouble-free adhesive backing that sticks right in place.